Recent headlines may imply that the EU may want to make an example of the UK for having the temerity to leave their EU club. Michel Barnier was at a recent conference “Intelligence on the World, Europe, and Italy” held on 1st – 3rd September 2017 in Italy. The forum is an annual event of international scope and prestige. Heads of state and government, top representatives of European institutions, ministers, Nobel prize winners, businessmen, managers and experts from around the world have been meeting every year since 1975 to discuss current issues of major impact for the world economy and society as a whole. While he did not want to punish the UK for leaving he did confirm Brexit would serve as an “an educational process” for the British. There are extremely serious consequences of leaving the single market and it hasn’t been explained to the British people. We intend to teach people what leaving the single market means. While these comments may have been taken out of context, it may be a true example of the real mentality behind the negotiation stance being taken by the EU. It may also explain why the EU appears to be presenting a series of conditions for the UK to accept, a fait accompli, rather than a series of items that can be used as a basis for discussion and why the negotiations themselves do not appear to be making much progress. The political ideology as being promoted by Barnier, Juncker and Verhofstadt may backfire eventually if there is a danger of the UK and EU having to adhere to WTO rules for their future trading relationship. 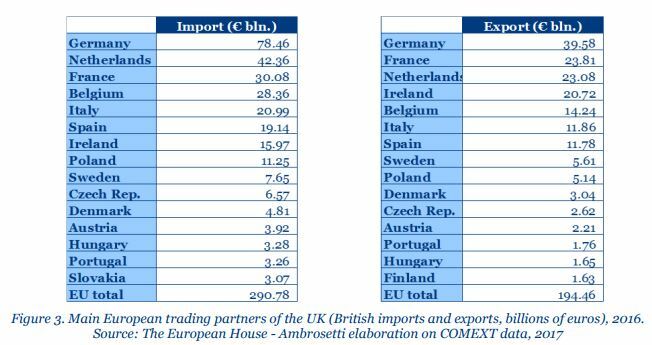 Where countries which have large trade exports to the UK such as, Germany Ireland and the Netherlands may suffer more than other countries in the EU. This could well see the EU and UK adopt a set of WTO trade rules which will govern their future trading relationship. In other news from the conference, a paper was presented titled “BREXIT one year later: Main implications and proposals to manage the transition underway” which explores and analyses the impact of Brexit on the EU and UK. According to the estimates of the European Commission, the hole left by the UK’s exit in Community finances will be over 10 billion euros per year. Source: Reflection Paper on the Future of EU Finances, 28 June 2017. The real impact of Brexit is linked to the result of the negotiations between the two sides. The scenario that seems to emerge shows that neither the EU nor the UK will likely see an improvement in their conditions as a result of London’s exit from the EU. Our greatest hope is therefore that the parties in question can build up the political will and the regulatory framework necessary to lead to an interruption and reversal of the current process, reconsidering Britain’s remaining within the EU. A view of the future from a Leaver. The purpose of this (online) book is to set out the mechanisms the UK might employ in leaving the European Union. It is a “roadmap” to demonstrate that an orderly exit is both plausible and practical and largely risk-free.